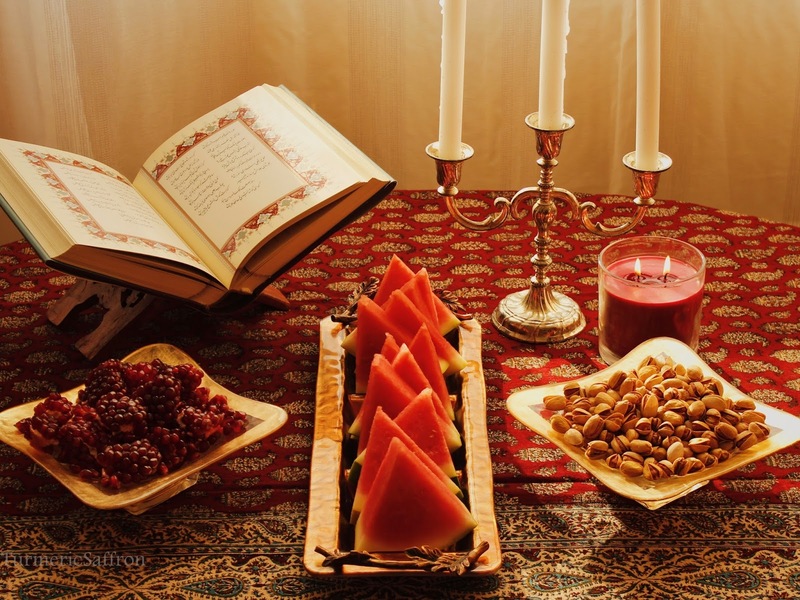 Yalda, the ancient Persian festival of winter solstice is celebrated on the eve of the longest night of the year which also marks the beginning of the winter season in the northern hemisphere. شب یلدا Shab-e yalda (yalda night) festival dates back several thousands of years ago to the birth of Mithra, the light of the world and the god of justice and victory. It's a wonderful night when family and friends gather together to celebrate, laugh, eat, drink, and read the poetry of Hafez and tell stories late into the night. For me, besides the memorable yalda nights of my childhood which involved delicious food, ruby red seeded pomegranates, small round watermelons, ajil, sweets and tea, it's remembering how adamant my mother was to instill the appreciation for shab-e yalda and all other Iranian celebrations in me. I came across this faloodeh recipe a few years ago. I was so intrigued by its simplicity and availability of the ingredients that I made it right away, took a photo, and posted it on my Facebook page. Ever since then I have had this recipe on my mind and I wanted to post this fresh fruit based faloodeh/paloodeh on my blog. 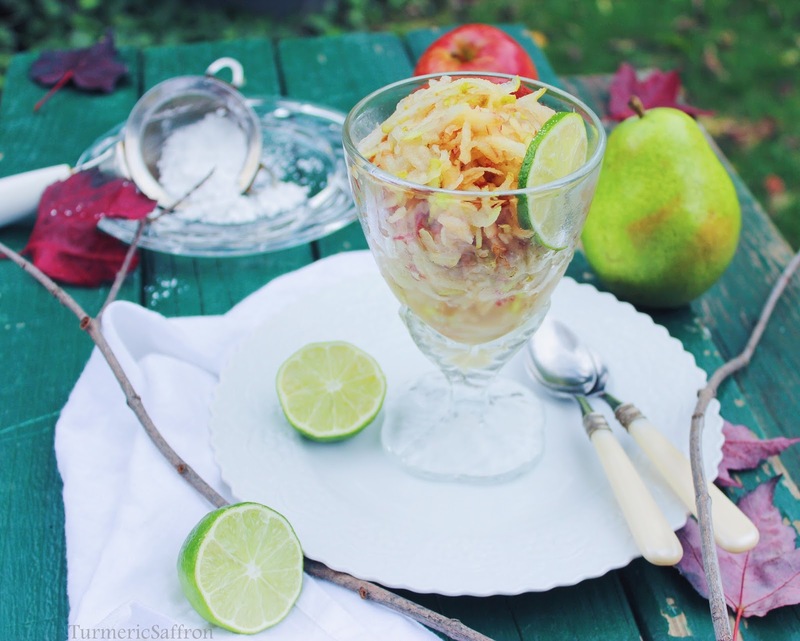 I like the combination of fresh apple and pear flavors in this Iranian-style faloodeh/paloodeh. 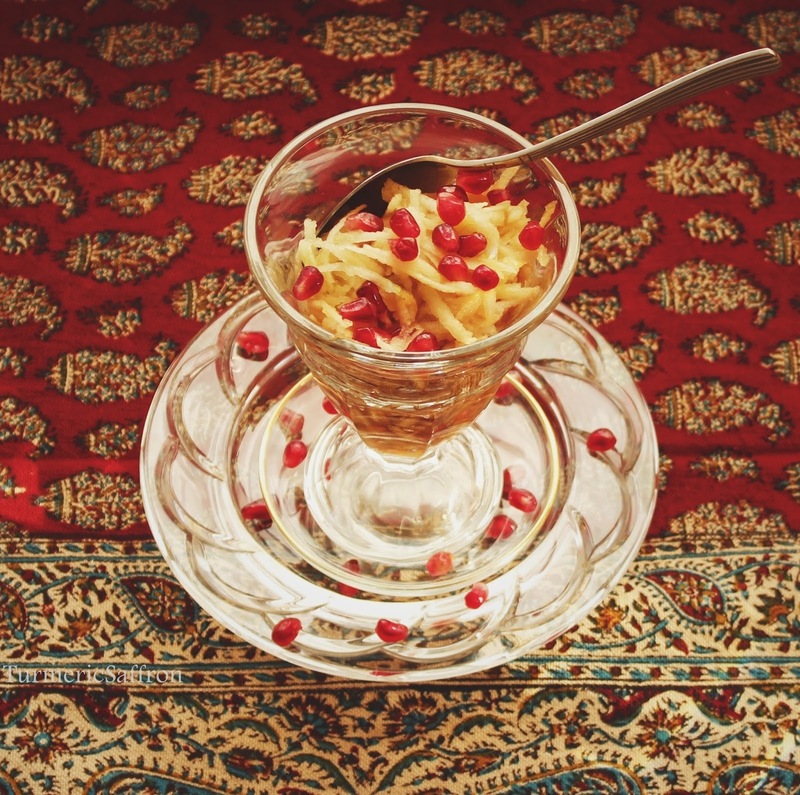 The term faloodeh also refers to the Iranian frozen rice noodle dessert that is served with sour cherry syrup. There are many different types of apples and pears. 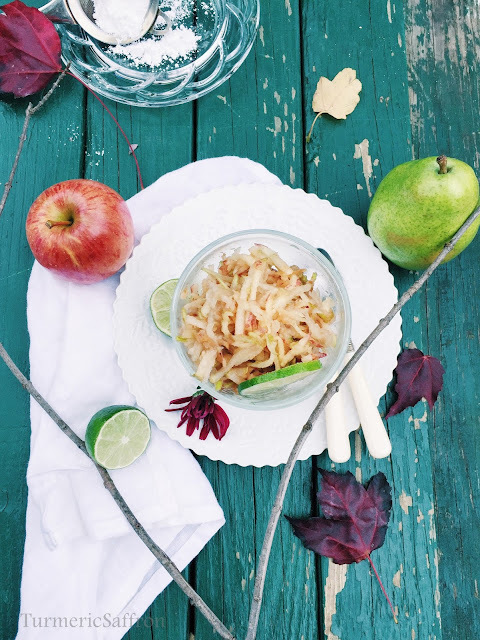 They vary in color, texture, and taste and since everyone has their own favorites, you may choose whichever type of apple or pear that you prefer for this recipe. This recipe was adapted from the British Museum website a long time ago and the direct link seems to be broken. Here's the link to the Apple and Pear Sherbet post on my Facebook page 5 years ago. Thoroughly rinse the fruits in cold water, pat dry with a paper towel or cloth and grate them using a handheld grater. If you prefer, you may remove the skin but it's not necessary. Place the grated apples, pears, lime juice, rosewater and sugar into a bowl. Stir and mix it well. Scoop the faloodeh into serving bowls/glasses and make sure you serve it right away since apples and pears turn brown quickly. You can spoon it over ice cream, yogurt, or simple cakes or just eat it plain. *You can turn the apple and pear faloodeh into a drink by simply adding a cup of cold water and 1-2 cups of ice.